This data set provides (1) areal estimates of deforestation events (>25 ha) that were identified from 2001-2004 in Mato Grosso by the Brazilian Institute for Space Research (INPE) as part of the Program for the Estimation of Deforestation in the Brazilian Amazon (PRODES) and (2) the classification of the post-deforestation land use as either cropland, cattle pasture, or not in production (deforested areas that were never fully cleared or returned immediately to secondary forest) in the years after the large deforestation events from 2002-2005. Data are provided in ESRI shapefile format. There are five compressed (*.zip) data files with this data set. Each shapefile represents one year of post-deforestation land use. Land use in the years following deforestation was estimated using annual time series of MODIS NDVI (normalized difference vegetation index) and EVI (enhanced vegetation index). 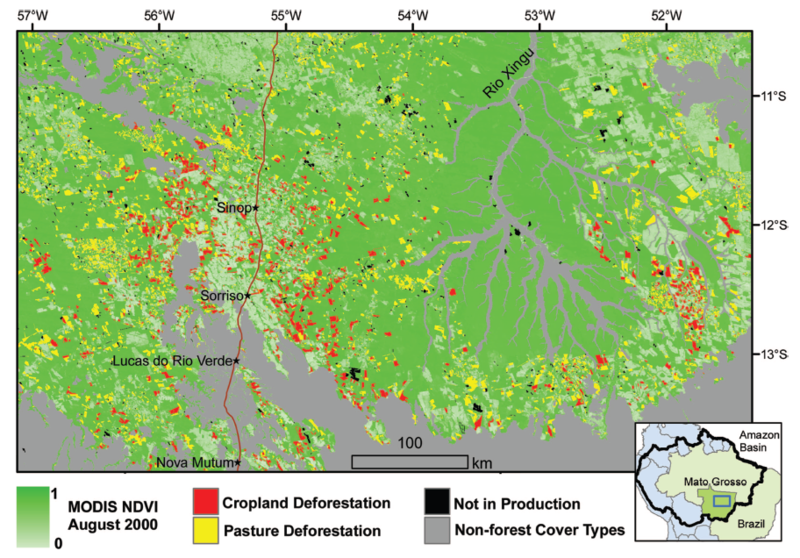 Metrics of vegetation phenology derived annual time series of MODIS NDVI and EVI data were analyzed using a decision-tree classifier to characterize the major cover type in each area of new deforestation. Post-deforestation land use for each large deforestation event was classified based on the classification of MODIS phenology metrics for all years following deforestation during 2002-2005. Figure 1. Classification of the post-deforestation land use as either cropland, cattle pasture, or not in production (deforested areas that were never fully cleared or returned immediately to secondary forest) in Mato Grosso state (2001–2004). Deforestation is concentrated along the existing agricultural frontier. (Inset) Location of the study area subset within Mato Grosso state and the Amazon Basin. From Morton et al. 2006. This data set was archived in June of 2012. Users who download the data between June 2012 and July 2017 must comply with the LBA Data and Publication Policy. The investigators were DeFriesi, Ruth; Shimabukuro, Yosio Edemir; Anderson, Liana ; Coura, Samuel Martins da Costa; Espirito-Santo, Fernando Del Bon; Hansen, Matthew C.; Jasinski, Ellen W; Latorre, Marcelo Lopes; Lima, Andre; Morton, Douglas and Piromal, Rodrigo Sbravatti. You may contact Morton, Douglas (douglas.morton@nasa.gov). This data set provides (1) areal estimates of deforestation events (>25 ha) that were identified from 2001-2004 in Mato Grosso by the Brazilian Institute for Space Research (INPE) as part of the Program for the Estimation of Deforestation in the Brazilian Amazon (PRODES) and (2) the classification of the post-deforestation land use as either cropland, cattle pasture, or not in production (deforested areas that were never fully cleared or returned immediately to secondary forest) in the years after the large deforestation events from 2001-2005. There are five compressed (*.zip) files with this data set. Each file includes the size and location of deforestation polygons and their post-clearing land use for one year (2001 through 2005). Files are provided in zipped ESRI ArcGIS shapefiles. When extrapolated, each zip file contains six files (.dbf, .prj, .sbn, .sbx, .shp, .shx). 3 = NOT IN PRODUCTION (deforested areas that were never fully cleared or returned immediately to secondary forest). Multi-year analyses of the fate of deforested areas can be used to better understand the spatial and temporal patterns linking deforestation to social and economic drivers. See Morton et al. (2006), Morton et al. (2008), and van der Werf et al. (2009) for further discussion of the use and interpretation of the post-clearing land use data set described in this document. Field observations completed in March and July 2005 were used to validate site classifications. Overall accuracy for the 2005 classification was estimated at 89% and the same classification rules were applied to all the years in the study (Morton et al., 2006). Mato Grosso, the third largest state in Brazil, is part of western Amazonia to the north, while the southern portion is part of the Pantanal. The border of Mato Grosso and Tocantins is the location of wetlands of the Ilha do Bananal. Deforestation for large-scale cropland has resulted in 17% of forest loss in large clearings during 2001–2004, and pasture remains the dominant land use after deforestation. Field data were collected during June 2004, March 2005, and July 2005 on the location and condition of deforested areas, pastures, and croplands. These data were combined with satellite-based data provided by INPE before each field campaign and georeferenced to existing Landsat Enhanced Thematic Mapper Plus (ETM+) data provided by the Global Land Cover Facility with a spatial error of less than one pixel (30 m). We used PRODES digital results of the annual deforestation increment mapped using Landsat TM data from approximately August of 2001–2004 to identify the location and size of new clearings and summarize total deforested area, limiting our analysis to new clearings >25 ha based on the moderate resolution (250 m) of the MODIS sensor (Morton et al., 2006). Estimates of 2005 deforestation were generated from MODIS red reflectance data contained in the MODIS/Terra Vegetation Indices 16-day L3 Global product at 250-m resolution and forest information from the PRODES 2004 deforestation analysis (Morton et al., 2006). The data were then used to train a decision-tree classifier based on metrics of vegetation phenology from annual time series of MODIS NDVI (normalized difference vegetation index) and EVI (enhanced vegetation index) data, as described in Morton et al. (2006). Large deforestation events were classified according to post-clearing land use as cropland, pasture, or not in production based on the majority cover type within the perimeter of the new deforestation event during the years following deforestation. Post-clearing land use for deforestation in 2001 included an assessment of four years of MODIS data following clearing (2002-2005). Post-clearing land use for 2002 deforestation was based on MODIS data for 2003-2005. Post-clearing land use in 2003 was based on MODIS data in 2004-2005. Deforestation in 2004 was included in Morton et al. (2006), with post-clearing land use based on MODIS data from a single year (2005). The classification of land use following 2004 deforestation was updated in 2007 using 2006 MODIS data, and post-clearing land use for 2005 deforestation was also estimated using MODIS data from 2006 (Morton et al., 2007). Therefore, two sets of classification results are included for 2004 deforestation -- one based a single year of MODIS data to evaluate post-clearing land use (Morton et al., 2006) and a second classification based on the trajectory of post-clearing land use for two years following deforestation (Morton et al., 2007).